The wearable robotic exoskeleton market is experiencing an advanced rate of growth over the past couple of years due to increasing demand of robotic assistance and rehabilitation application for the therapy of patients suffering from neurological and musculoskeletal disorders. This high scale of growth of the robotics industry is subsequently influencing the wearable robotic exoskeleton market, wherein a new range of programs are being carried out to develop latest exoskeleton technologies, such as soft actuators, 3D printed exoskeleton structure, and highly efficient & durable Li-ion batteries, among others. 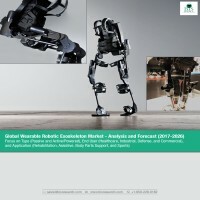 The growing demand of exoskeletons for varied industries for applications, such as rehabilitation, assistance, body part support, and sports, is a major factor driving the growth of wearable robotic exoskeleton market. Furthermore, the wearable robotic exoskeleton market has been a significant area of focus in the robotics industry, in order to deliver consistent & repeatable movement therapy, improve endurance & safety in industrial settings, bring new capabilities to fighting forces, increase productivity at work place, reducing the risk of injury, and also facilitate recreational activities such as skiing, golfing, and hiking, among others. In terms of revenue, the wearable robotic exoskeleton market generated $96.0 million in the year 2016. What is the size, in terms of revenue and volume, of wearable robotic exoskeleton market in 2016, and growth rate during the forecast period, 2017-2026? What is the market size of different types of exoskeletons (active and passive), based on the industry (healthcare, industrial, commercial, and defense) in which they are being utilized? What was the market value of different applications of exoskeletons in 2016, on the basis of varied industries? What is the market size of exoskeletons on the basis of different geographical regions and respective leading nations? Furthermore, what is the market size of different types of exoskeletons being consumed in these regions? What are the key trends and opportunities in exoskeleton market, across different regions and respective countries? What are the major driving forces that tend to increase the demand of exoskeletons during the forecast period? What kind of new strategies are being adopted by existing market players to make a mark in the industry? What is the competitive strength of key players in the wearable robotic exoskeleton market by analyzing through market share analysis and competitive benchmarking model? 10.5 Daiya Industry Co., Ltd.
10.6 Ekso Bionics Holdings, Inc.
10.9 Honda Motor Co., Ltd.
10.11 Mitsubishi Heavy Industries, Ltd.
10.13 P&S Mechanics Co. Ltd. Rapid advancements in robotics technologies in the recent years has led to the emergence and growth of robotic exoskeletons, a distinctive field of robotics. Exoskeletons are defined as robotic wearable devices, providing augmentation to the body parts, rehabilitation of the dysfunctional sensory movements, and assistance to the disabled people. The first exoskeleton was developed in 1890 by Nicholas Yagin, in Russia, which was basically a set of apparatus for walking, jumping, and running assistance. Overwhelming need and interest to incorporate sensing and assistive technologies into therapy for neurological disorders such as stroke, central nervous system disorder, and spinal cord injury, has led to an increasing demand of exoskeletons for rehabilitation and assistive applications. Utilization of exoskeleton have its advantages over the conventional method of manual therapy, as it is capable of providing intensive training for patients, improved functional outcomes, and better quantitative feedback. In addition to this, exoskeletons deliver a novel solution for other emerging industries too, including industrial, defense, and commercial, for different set of applications, such as assistance, sports and body parts support. The wearable robotic exoskeleton market will take several years to reach its full market potential and commercialization. Currently, commercial exoskeleton devices tend to be cumbersome and slow, and hence, need to be more user friendly. Moreover, the cost of powered exoskeletons present in the market is very high as compared to the passive ones. However, exoskeleton technology is continuously improving, thus, it will be only a matter of time before exoskeletons become cost effective, user-friendly, and reliable. One of the strategies opted by manufacturers to reduce the selling price is by continuously upgrading and optimizing their products, conducting clinical trials, and expanding their sales and distribution network. Another way to reduce the selling price of exoskeletons being utilized by manufacturers is to reduce the complexity of the powered exoskeleton. The wearable robotic exoskeleton market is witnessing a high growth rate owing to machine intelligence surpassing human intelligence in defense industry, rise in demand of exoskeletons for rehabilitation application, and rapidly growing aged population. Recent innovations in exoskeleton components and services has enabled the exoskeleton technology to reach a wider segment of consumers in the industry. However, stringent government regulations for exoskeletons in healthcare industry and high selling price of powered exoskeletons, contribute as major challenges for the market. Companies are developing various forms of emerging technologies such as 3D printed electronic components & structure, durable batteries, and soft actuators, among others to develop cost effective and affordable exoskeletons. This, in effect, is expected to increase competition in the near future as well as facilitate the utilization of exoskeleton for varied applications. The wearable robotic exoskeleton market reported a revenue of $96.0 million in 2016, with healthcare industry accommodating for the highest revenue by 2026. As the figure shows, the healthcare industry contributed largest share to the exoskeleton industry, owing to substantial number of companies in the market are manufacturing powered exoskeletons for medical usage. In the year 2016, exoskeletons for defense were mainly test trialed by the companies as a part of research and development initiatives and commercial sale was not noticeable. However, the industry is expected to grow with the highest growth rate during the forecast period, 2017 – 2026, owing to the involvement of key manufacturers as well as defense organizations in developing efficient exoskeletons for military usage. The future demand for exoskeletons across different geographies is expected to be promising, with Europe having the highest market share during the forecast period (2016-2026), followed by Asia-Pacific, North America, and Rest of the World. Europe is expected to maintain its dominance through the forecast period, owing to the developments in active exoskeletons for healthcare industry. Emerging start-ups in the region are also very keen to develop passive exoskeletons for applications such as back support, skiing, arm support, leg support, upper body fixed rehabilitation, and military. Furthermore, there is higher spending in healthcare by the governments of different nations in the region, which accounted for 41.0% of the overall healthcare spending worldwide, in 2016. Moreover, Asia-Pacific is expected to witness the highest growth in the market, owing to increased military spending.